After a hard-fought battle, the Cardinals came out with the win on June 7. The Major Red Sox and Major Cardinals Tehachapi Little League teams before the start of their District 51 North Tournament of Champions game. The Tehachapi Little League Red Sox and Cardinals major division baseball teams progressed to the District 51 North Tournament of Champions, which was played last week in California City. The Cardinals advanced to the overall finals on Saturday after winning 9-6, but were defeated by the Quartz Hill Yankees major division team. Coach David Towery of the Tehachapi Little League Major Red Sox team said it has been a couple of years since Tehachapi Little League teams advanced to the Tournament of Champions. "Both teams were excellent," Towery said. Both teams finished their regular season 16-2, said Towery, who added that the the teams will now move on to playing all-stars. 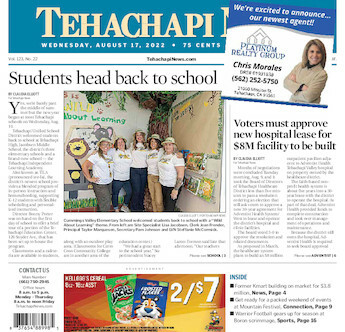 The Tehachapi Little League will be holding its Closing Ceremony at 9 a.m. June 16 in West Park, located at 490 W. D St.